I have been a collector of classic cars for 35 years. This is one of my classics from my personal collection, see otheres at, www,gccc.us The 1964 Chevrolet Impala 2dr hdt SS Hardtop Sport Coupe with automatic transmission was the last year of X-frame and this particular car is truly an amazing automobile. This car is a real scream but is also a very good car to drive around town. 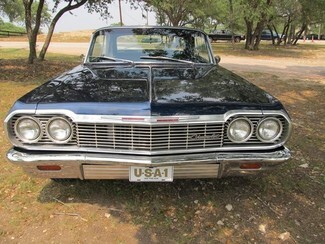 And its powerful 454 cu.in engine sets it apart from a lot of other popular muscle cars of its time. Everything about this car is nice. From the sleek body and paint job to the beautiful interior with its custom steering wheel, center console and bucket seats with center console...this cars got it all. The brakes are excellent, the steering can be done with one finger, the ride is smooth and the roar of the custom exhaust system really complements the power of the motor. Running or sitting still, this car gets a lot of attention! ~~ADDITIONAL EQUIPMENT ?? ?Power Steering ?? ?Power Brakes ?? ?AM/FM Radio w/CD Disk Player OPTIONAL EQUIPMENT ?? ?High Performance Exhaust System This car is not only a great investment, but it's also an important part of automotive history. So if you're going to buy this classic to sit around and appreciate in value, you can do that. But you can also feel very comfortable driving it around without worrying if you're going to break down somewhere. This is a classic you can appreciate if it's parked in a garage, a showroom floor or out driving on the highway.